Fine adjustment according to the environment very easy. Simple carburetor is a mechanical device and it will respond uniquely in every possible adjustment. There is no restriction on the amount of fuel drawn to the cylinder from the float chamber. It can provide a denser mixture at high speed for great power. Easy and affordable carburetor repair maintenance. Carburetor vehicle shows more power and precision in the road test. At low speed, the amount of fuel in air-fuel mixture is very low. This too lean mixture will not ignite properly. At that conditions, some arrangement is required for the proper running of engine. It gives stoichiometric mixture only at one specific speed and load. Simple carburetor is more suitable for engine running at constant speed. 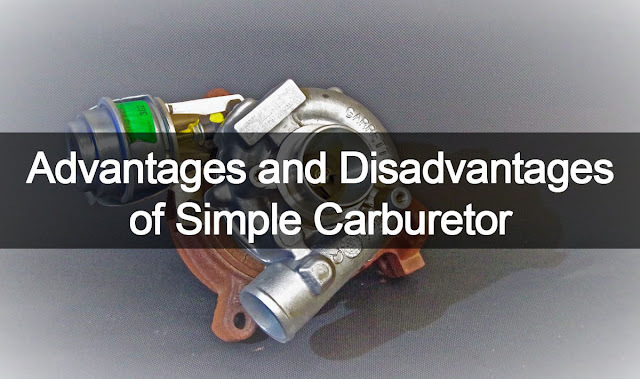 Several modifications have made to overcome this drawback of simple carburetor. Fuel economy is very low. It consumes more fuel than the fuel injectors. The working of simple carburetor will be affected by the atmospheric pressure. The setting for carburetor varies with varying altitude. The working of simple carburetor will be affected by the change in atmospheric temperature. It happens because of the change in density of air with a change in temperature. The cold starting of the engine is a big issue. If the carburetor tune up is done in winter, it will give a richer mixture at summer season. The mixture quality will be affected by the inertia of fuel. Sudden opening of throttle leads to the supply of too lean mixture to the cylinder because the inertia effect prevents the immediate flow of fuel (sudden acceleration and starting time).